November 2001: Non plantation tree and vegetation in Livingston Creek tributary. 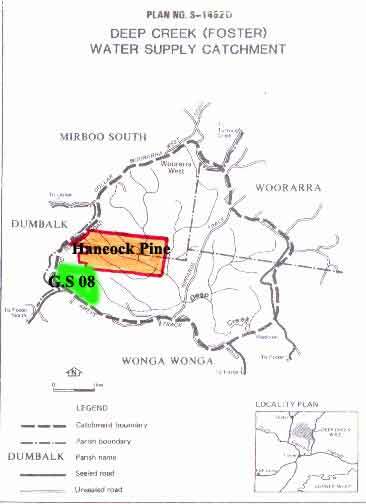 Area within Planthard Hardwoods (Drouin West Sawmills) area of supply. 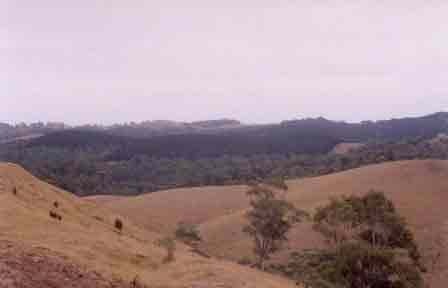 Disjointed plantation area, covering land in the Tarwin River and Franklin River Catchments. Cool Temperate rainforest on Turtons Creek. Highly likely that this rainforest stretches into Livingston Creek. This rainforest stretches for about 1.5 km. November 2001: Old tree ferns Livingston Creek tributary. August 2004 (3 images above): Turtons Creek catchment. Recent clearfelling of pine off Anyos Road. Disjointed plantation mass consisting of 4-5 separate plantations. One visit was made to a small pine plantation established on farmland in 1981. This plantation obviously warrants a low conservation priority. November 01: Drove along Woorarra West Road into plantation situated north of the turnoff to Turtons Creek. Native vegetation present on the northern portion of the plantation. Drove into area which is the headwaters of a tributary of the Tarwin River East Branch. This area is dominated by regenerating vegetation with the occasional older ash tree. The rest of this plantation consists of hardwood plantations established in the mid-seventies and early eighties. Drove further along McCartan Track to the junction of Livingston Creek Road. At the south west portion of this plantation is several tributaries which feed into Livingston Creek. These gullies were dominated by Blackwood and Silver Wattle and very old tree ferns. Along several of the ridges and in several of the gullies were old growth eucalypts - some of which were very large in diametre. (Photo above - Feb 04). Foster water supply catchment looking west from Turtons Creek Road. Note Hancock plantation! After this site we headed south then east then north along Dollar Woorara West Road and Turton Creek Road. Along Turton Creek Road it was evident that recent pine plantations had been logged on the western side of the creek. Many trees had been cut from gullies and from a close proximity to Turtons Creek. It was also apparent that blackberries had recently been sprayed along Turtons Creek, with herbicide most likely leaching into the water of the creek. At a crossing of Turtons Creek we crossed back into the main plantation proper to witness recent logging operations. It was apparent that although some native vegetation had been left in buffers, many of the buffers were of limited or non-existent benefit to protecting water quality. It was also apparent that older eucalypts had been cut down in this plantation and there was a very high quality buffer system protecting a couple of the tributaries of Turtons Creek and possibly Livingston Creek. In these buffers was old growth ash. The eastern side of Turtons Creek was dominated by pine plantations and farmland. 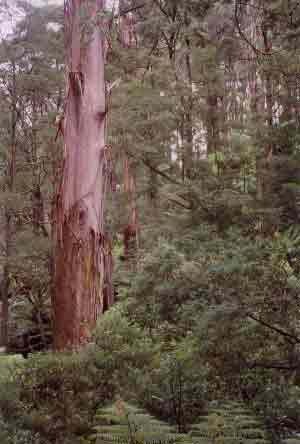 November 2001: Old growth ash in headwaters of Tarwin River East Branch. November 2001: Old growth in head waters of tributary of Livingston Creek. Declared Water Catchment Area: MOST OF THIS PLANTATION LIES WITHIN TARWIN RIVER (MEENIYAN) WATER SUPPLY CATCHMENT. PROCLAIMED 24/4/90. Above map showing extent of Hancock pine plantation that lies within the Deep Creek (Foster) Water Supply Catchment. The Green area (G.S. 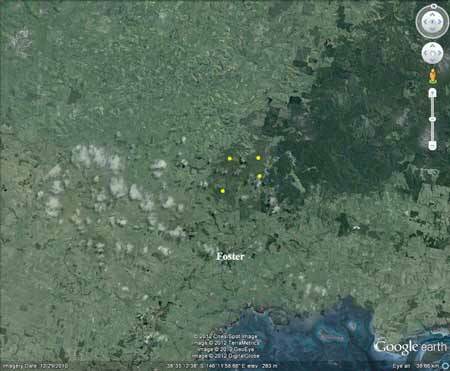 08) is approximate area that Great Southern Plantations purchased for a bluegum plantation in 2007. Simazine and Amitrole will be used as some of the herbicides in this plantation. (Update 2012: Doesn't look like The Great Southern plantation was ever established, due to the company collapsing). 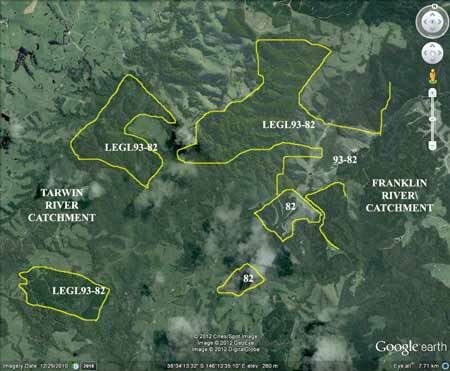 THREATENED FISH NOTES - TARWIN RIVER: Consistent records of Australian Grayling. November 2001: Old growth in headwaters of a Livingston Creek tributary. The Deep Creek WSC supplies the town of Foster and surrounding rural area with water (>1300 people). Geology inside the catchment: Lower Cretaceous sandstone, siltstone and mudstone with minor Lower Devonian sandstone, mudstone and shale deposits. Soils: Porous earths. Average rainfall: 1140mm. October 2000: 39.1 ha sprayed with 742.9 kg of Velmac G herbicide to kill regenerating silver wattle. Catchment Managment Authority: West Gippsland Catchment Management Authority. p5 Before European settlement, all of the catchments . . . were covered with similar tall tree vegetation associations. However, the early settlers almost totally cleared the area of this vegetation for pasture and grazing management. Farming could not be sustained in many situations and regrowth of native species was allowed to occur, much of it since the 1930�s and as recently as the 1950�s. Much of the regrowth comprises scrub species and these are gradually being restored to the original species composition . 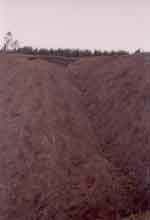 . .
Turtons Creek, Foster: Flows through cleared hilly country in a series of runs and pools, rock and gravel bed. Self sustaining for trout. Contains mostly brown trout average 150g, eels, and river blackfish. Subject to a blackfish closure. Tarwin River, Tarwin: East Branch upstream from Mirboo: Flows through cleared hilly country as a series of runs and pools, rock and gravel bed. Turtons Creek section of the system is self sustaining for trout. Tarwin River, Tarwin - Mirboo to junction with West Branch: Relatively slow flowing with some deep holes, mud and sand bottom. Access restricted by private property. Considered marginal for trout and need for supplemental stocking is assessed annually. Contains brown trout average 100g, some 400g but occasional larger fish, river blackfish, eels and tupong. November 2001. Old growth stump logged in the past year or so near a buffer zone of a tributary of Turtons Creek. Tree stump would have been approximate age of trees retained in buffer in background. Tree cut most likely by Victorian Plantation Corporation. Deep Creek, Foster: A fast flowing stream rising in timbered hilly country, rock bottom. Lower section is highly modified by agriculture. Access is very difficult and in most places walking is necessary. In the headwaters, where the catchment is not highly modified, there is a viable population of trout. Franklin River, Foster: A fast flowing stream rising in timbered hilly country, rock bottom. Middle and lower reaches are highly modified by agriculture. Access difficult and in most places walking is necessary. The headwaters contain brown trout to 400g, occasional larger fish, average 160g, some river blackfish and eels. In the lower reaches mainly shallow but some deep holes, sluggish flow, mud and sand bottom. Contains an abundance of eels. Few other fish caught. Estuarine section contains the usual estuarine fish found in district, including estuary perch to 1.4kg. November 2001: A tributary of Turtons Creek consisting of old growth trees within Hancock plantations. November 2001: Tributary of Turtons Creek recently cleared of its pine plantation. Minimal buffer zones were evident at this site. November 2001: Recent pine logging on quite steep slopes on the western slopes of Turtons Creek. Minimal buffer zones. November 2001: Photo shows Turtons Creek east side covered with radiata pine with some regenerating native species. Cleared land in foreground is the western side of Turtons Creek. November 2001: Low conservation priority plantation near Turtons Creek Road.